America’s approach to counterterrorism has been utterly transformed. In 2001, the country was not only caught flat-footed by al-Qaeda, but also had no coordinated response to the attacks. The subsequent wars in Afghanistan and Iraq, and the massive movements of men and munitions required to fight these conflicts, concealed a deeper truth: America’s efforts to fight terrorism were clumsy and out of date. 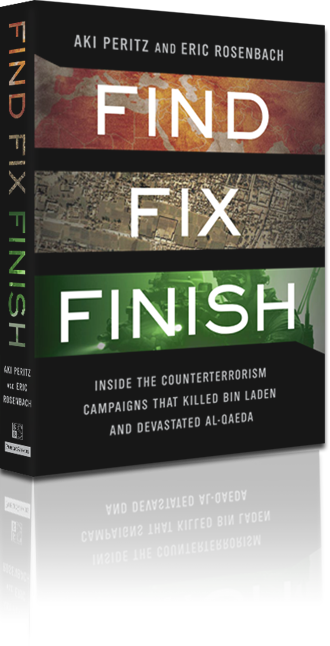 Find, Fix, Finish is the revelatory work from two highly-regarded insiders who have seen firsthand the evolution of U.S. security policy since 9/11. They describe how the U.S. rediscovered a strategy used by General Ulysses S. Grant in the Civil War, updated it, and redeployed it in the most technologically-advanced fighting force the world has ever seen. They are frank about the successes and failures along the way, and the moral and legal dangers of operations that show little regard for national boundaries or political approval processes. Their story is a gripping narrative of how America chased after, ring-fenced, and then eliminated its most dangerous adversaries, having gotten to know them individually to a remarkable degree of detail. In ever more lethally incisive interventions, the U.S. has developed the capacity to tackle its foes wherever they may be throughout the world. It’s a stunning, even alarming, new reality—one that we must navigate, the authors argue, with the greatest discretion and moral care. This is the definitive account of the post–9/11 counterterrorism world. If you would like to send me a message or inquire about my availability for speaking engagements, please get in touch. Thank you.